SportsDork.com » 2008 NFL Draft -- Philadelphia Eagles Rumors, Commentary, News. NFL Rumors, News. Videogame News. I’m still feeling a little disheveled after this draft. All the thought that went into determining who the Eagles should take at #19 was a waste, just like it was with last year’s first. Likewise, all the effort that went into the supposed certain Lito trade has thus far been for naught — #26 still has a locker at the NovaCare Complex. So, yeah, this is going to take a few more days to sink in I’d say. That being said, taking a look at the players acquired, there’s no reason to be up in arms. DeSean Jackson improves this team on day 1. Period. You can’t complain about that. Sorry, Reno. You’re a nice guy and I’m sure you’ll do well in the food service industry again. Everything I read says Trevor Laws is as ready to play in the NFL on opening day as anyone in this draft. If that’s true, and he actually does rotate in relief of Bunkley and Patterson then this pick is also a good one. Otherwise, if we’re waiting a couple of years for this guy, I hate the pick. I don’t understand the Bryan Smith selection. Sure, the Eagles got a safety in the next round, but I was getting pretty excited for the hard-hitting Dujuan Morgan in this spot. As it turns out, he ended up being selected only a few picks later. The Eagles did get a safety in round 4 — and this will be something to remember and watch down the road — the careers of Morgan and Demps. The rest of the guys are projects for sure. Maybe the Eagles got a gem in Ikegwuonu, maybe they got an injured criminal who won’t play a down in the league. Time will tell. As to Lito — this may just drag out for a while now. Your guess is as good as mine. What I do know is this: Lito is NOT going to accept a job as a nickel corner happily (neither is Sheldon). So forget that idea. I’ll have more on this later. So here’s what we know after Day 1 of the draft — NFL teams are, somehow, still very good at keeping secrets. We know this because today was as unpredictable as anyone could imagine. Seriously, was there anyone out there who thought Donnie Avery would be the first wide receiver off the board? That Chris Johnson would be a first round pick? (and 22!) Or, for that matter, Antoine Cason, Joe Flacco, Sam Baker, and Dustin Keller would all go in the first? There isn’t a single mock draft out there on the Internet that even closely resembles today’s results. As to the Eagles — it’s difficult to feel strongly in either direction about their day. On the one hand, it’s another year without a first-round player. On the other hand, holy crap! Did they ever take the Panthers to the cleaners. I’ve long been critical of DeSean Jackson as a first round pick here, but as pick #49? Sign me up. Remember, I was high on Chris Johnson in the second round because of his all-around explosiveness and ability to contribute on special teams. Jackson immediately brings some firepower to the punt and kick return units. Do I think he’s ever going to be a #1 or #2 receiver? No, I don’t. He’s too small. The odds are stacked really high against it. But he could be a deep threat in the right situations, and the Eagles could run some plays specifically designed to take advantage of his talents — like the Bills do with Roscoe Parrish. As for Trevor Laws — nothing glamorous with this pick, just the usual Andy Reid mindset that the offensive and defensive lines are priority #1. It will be nice if this guy actually contributes in his first year spelling Bunkley and Patterson — but at this point should we really expect that? The Eagles track record with defensive rookies points to Laws spending a season on the sidelines. And if that ends up being the case, this was a horrible pick — this team is ready for a run this season. Here’s the second round data. Almost every prognosticator has changed their pick for the Eagles. Phillip Merling suddenly became a popular name associated with the Eagles in our mock draft spreadsheet. Today he’s holding a last-minute workout for scouts at Clemson. Take what you want from this, but the Eagles didn’t send anyone to observe. 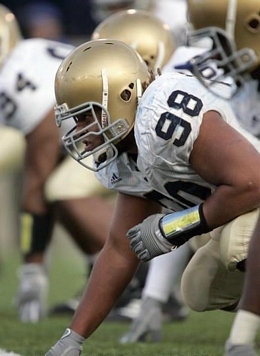 Merling hasn’t gotten to work out for any NFL teams since a February surgery. Today will mark the final edition of the 2008 Mock Draft Spreadsheet. It’s been a few days since the last update, and since then we’ve seen the continuation of one trend and something totally new. The resurgence of the wide receiver has continued — now 10 of our 21 “experts” predict the Eagles will be selecting a wideout with the #19 pick. Devin Thomas continues to dominate that group, the favorite in 60% of those picks. The other development, which I didn’t see coming, was a surge in defensive end predictions. It’s the second most popular position now (although a distant second), with Philip Merling suddenly becoming a very popular name associated with the Eagles. Take a look at the data yourselves, and come Monday morning we’ll get to see who amongst our “experts” has been on point. Second round coming later today. 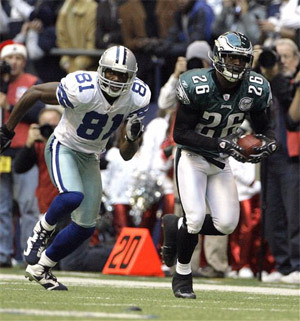 What never follows is any mention of the fact the Eagles made it to the Super Bowl without Terrell Owens playing in either of the playoff games. We have to get a receiver and Thomas is the best on the board. The last time the Eagles had a legit No.1 receiver, they went to the Super Bowl. Not comparing Thomas to Owens — that’s hard to put on a rookie – but it’s been proven that with more speed at this position, Donovan McNabb can makes plays in this offense. It also allows more levels for TE L.J. Smith and opens up a lot for the offense. – Doug Kretz, Scouts Inc. There has been no organization that seems as consistently less informed than Scouts Inc. They really are embarrassing. As we inch closer to the draft one thing has become apparent regarding the Eagles’ mindset for a Lito trade — they would rather not receive draft picks. The Eagles have, according to various reports, offered Lito (in combination with their own picks) for Larry Fitzgerald, Jared Allen, Roy Williams, and Chad Johnson. They have also been rumored to be looking at moving up in the first round, and are offering Lito and their own picks to do so. There could be others. Presumably, there are offers on the table for Lito — which are likely to include draft picks heading the Eagles’ way. Unfortunately, it’s not the most attractive option for a team with an abundance of them already. The Eagles already have a talented roster and 11 draft picks. They are likely considering the potential of a nasty numbers game in July if all goes well in the draft. Another two or three picks for Lito will only complicate things further. Any other year and the Eagles would likely be very happy to accept a pick or three and move on — this is awkward timing. If they are unable to attain a player for Lito it is unknown if they would then consider trying to keep him — despite the obvious complications. Just another thing keep in mind on what we’ll surely be an interesting Saturday. A while back I declared my intention to avoid making my own mock draft, for reasons I won’t rehash here. But as the draft approaches, I feel the need to put some projection of my own out here. So with a bit of creativity I’ve put together what I’ll call my mock Eagles draft board. What I’ve done is “tier” the players according to where the Eagles should consider taking them — with their first, second, or third round pick. I’ve also eliminated some positions — QB, FB, C, DT, LB — which I feel the Eagles will be avoiding regardless of whose available. I’ve also not even bothered with a few players — Jake Long, Chris Long, and Darren McFadden. There is at least a possibility the Eagles could land anyone else through trade, but not those three. This chart does not apply to all NFL teams — only to the Eagles and their specific needs. If a player is “tiered” as a second round talent and he’s still available in a later round, obviously that is considered a bargain. Likewise, if a player is taken in the first round who is in the second-round tier, it is a reach (and should be booed). I’ll start by position rankings, with explanations where I feel they are necessary — then I’ll compile the list and rank each player individually in the list. The first round board I would follow exactly to script. The player ranked highest and still available should be taken. After that, the dynamics of the draft determine if the highest player should be skipped or not. Some major changes in our 2008 draft spreadsheet in the last few days. The shift away from DeSean Jackson has continued, this time with Devin Thomas benefiting. He now tops the “leaderboard” (he has company) amongst our experts. Joining him is Kenny Phillips — surely a controversial pick. Phillips and Thomas are both the choices on four of our mock drafts, doubling each of their totals from just a few days ago. I have seen no reports in the last few days to make sense of this Phillips’ surge. And after a little closer examination, the “experts” who have moved to Phillips this week previously had the Eagles selecting Chris Williams (expected to be gone before #19) and Jerod Mayo (the Eagles are not drafting a linebacker in Rd 1). So they both already lack a bit of credibility in my mind. Lito Sheppard is not going to be playing for the Eagles in 2008. Sheldon Brown is not moving to safety (yet), and Lito is not going to accept a role as a nickel corner (neither is Sheldon). Joe Banner is just posturing. The Falcons just traded away DeAngelo Hall and his ego to the Oakland Raiders. This has left them with a pretty ugly reality in the secondary — but a ton of draft picks to play with — thanks to trades and the NFL’s compensatory picks rule. I think this team would love to get their hands on a young corner with star power like Lito. They need some good press in town, and acquiring Sheppard would be a good move. They are definitely one of the presumed contenders. This might also be ideal for the Eagles, as the front office of the Falcons doesn’t exactly have a reputation for being brilliant. This is another team that lost a star cornerback — who is a proud new Eagle. 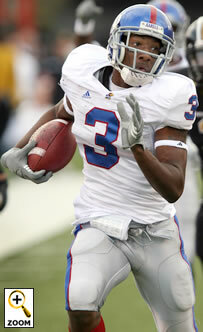 But they also lost another free agent, Randall Gay, to the Saints. Almost every mock draft has them grabbing a cornerback with the #7 pick, but they have also reportedly been inquiring on the status of Lito. I would be wary of dealing with the Patriots, but if they offer one of their second round picks it could be tempting. The Rams are another team with a terrible situation at the corner spots. Brown is going to be 31 this season and has never been a big-time playmaker (he has 10 career INTs). Likewise, their young corner opposite Brown has 4 career INTs in 85 games. The other wild card here is Torry Holt — whom the Eagles could be interested in. It is unlikely the Rams would be willing to trade the fan favorite though, who has spent his entire stellar career there. They don’t have a lot of resources to barter with, though — so they will be careful in any trade scenario. The Jets have been rumored to be calling the Eagles about Sheppard. They could use someone to take the side of the field opposite their promising young corner Darelle Revis. This is another team that needs depth in a lot of places, so they likely wouldn’t be offering much outside of draft picks. The Bengals corners are relatively young, but are they any good? They drafted Leon Hall last year and aren’t going to give up on him yet, even though he was absolutely abused in 2007. There is, of course, the Chad Johnson soap opera. It would take an incredible offer to pry him away, especially when you consider the Bengals would be burning $8 million in cap space while he’s playing for another team. I don’t see it happening. Still, they have a few picks to play with, and could be sniffing around Sheppard. Update: Obviously the latest comments from Chad Johnson probably change the dynamics in Cincy. Those are some strong words. The Chiefs still have the ancient but effective Patrick Surtain covering one side of the field, but the other side is a question mark. Patterson has some decent physical skills, but his play hasn’t inspired to this point. The team has no extra picks, and they don’t have a ton of depth to trade away. This is a team that might be offering picks in future drafts to the Eagles, if they are interesting in Sheppard. Update: The news that Jared Allen isn’t going to be a Chief in 2008 changes the dynamics here, too. Are the Eagles interested? They have already invested in Chris Clemons in free agency. On top of that you have last year’s 2nd round pick Victor Abiamiri and also Juqua Thomas. Still, an interesting development. I don’t think this team is interested, but because of the Roy Williams rumors someone would complain if I didn’t include them. They acquired a decent corner (Bodden) through a trade with the Browns, and they just re-signed Stanley Wilson. Still, the Williams rumors persist. I don’t think a cornerback is something the Lions, if they are even considering trading him, would be looking for in return. Well, there you have it — 7 potential trade partners for the Eagles. I think the trade is likely to come from this group. If you have any comments or suggestions please fire away.